Sound is caused by the propagation of pressure and density fluctuations (compression and rarefaction of molecules) in an elastic medium. Frequencies ranging from 20 Hz to 20 kHz, are audible for humans. Vibrations at frequencies exceeding 20 kHz are called ultrasound. Typical cleaning frequencies range from 35 kHz to 45 kHz. 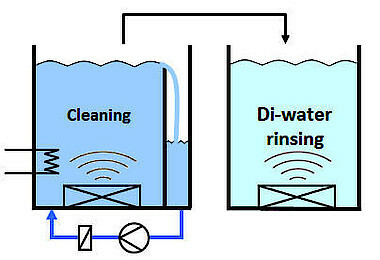 Through ultrasonic transducer elements attached to or directly fixed in the cleaning tank, under-inflation and overpressure waves spread in the cleaning bath. Cavitation creates a pressure jet (microjet) that helps remove the dirt particles from the surface. 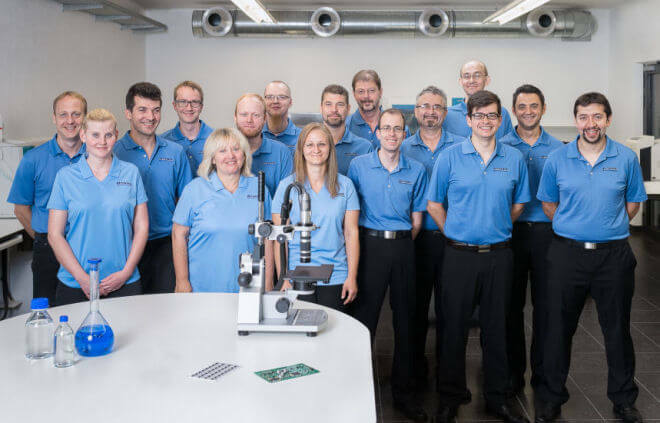 In the case of cleaning under components and in complex geometries, ultrasonic cleaning can be useful since the sound waves are capable of reaching every angle of the mounted circuit board. Many cleaning machines have an automatic frequency adjustment for the modulation of the working frequency of the ultrasound (sweep), which allows material-friendly cleaning by the prevention of "hot spots". According to J-STD-001 and MIL-STD-2000 Rev. A, the use of ultrasound in electronic cleaning is permitted. IPC TM 650 2.6.9.2. standard recommends a test procedure before using an ultrasonic application for electronic components.